Built from sturdy 24 gauge 18/8 stainless steel, this standard weight 1/6 size steam table pan features reinforced corners that add strength where the pan takes the most abuse. Ideal for use in hot and cold tables at your catering event or buffet, this impact-resistant pan makes cleaning and refilling a breeze. Easy to use and available at a great value, this anti-jam stainless steel pan is a dependable addition to any kitchen! Purchased to replace worn pans for a salad bar. These hold up very well to repeated daily use and cleaning and stay looking great long after they are purchased. Would purchase again. Excellent quality. Very nice finish, no sharp edges. Deep enough to hold fairly sizeable quantities of sauces, veggies, fruit, etc. Forget potentially harmful plastic Tupperware and switch to stainless. Cheaper than the brand name counterpart and does the job just the same. I use this for a small batch of sauces or holding hot sauces in the steam warmer. We use this in a cold condiment refrigerated station and keep high demand things such as cole slaw and diced onions in them. Lots of volume with these. We ordered these to go with our ServIt 3 pan steam table. The lips cover enough that you don't have gaping parts on the corners. Nice quality. Good quality steam table pan that does not bend easily. Easy to clean and stack nicely. Very versatile product. Never had problems with these steam table pans! The 6" deep pan is great for hot and cold items, we use this all the time and they are super easy to clean and the perfect size. Great one sixth size pans, they're thick enough and strong enough to last for a long time, without being too heavy and bulky. They do not get stuck when stacked. These choice anti jam table pans are priced right and durable, they clean up easily and fit tight in all my prep table frames, buy extra to reload during the rush. These 1/6 size came in very handy on our smaller tables. This is such a great product and a must have in a restaurant. We use them all the time for keeping things warm without melting containers. All of this things are a must have regardless the type of business, and being able to get them at this low price is great for start up business. These steam pans are good because they are tall. you can put quite a bit of product into them and as long as you make use of the top layer, the whole set of ingredients doesn't dry out for instance. Very durable and easy to clean. Doesn't bend easily. Works well in hot wells. Easy to stack and store in any area. Would buy again! These are the perfect size for many of the ingredients we use in our pizza prep table. On weekends we keep several in the fridge, already full of ingredients and covered with plastic wrap so they're ready to use at a moment's notice. Highly recommend the product. These pans are perfect for anything: sauces, chopped veggies, portioned meat. They can hold up to a ton of abuse and are worth every penny. Obviously, the 1/6 is a classic. But what makes it priceless is the acoustic qualities it imparts to an iPhone. This is the original kitchen phone amplifier. These steam table pans function exactly as you would expect, and a fantastic price. The material is appropriately thick, durable, and resitant to denting. If you manage to bend the top lip, it's easy to press it back into shape. I use these primarily for prep-work and moving components from one kitchen to another. This size is great for small ingredients (pickled vegetables, marinated thin-sliced meat, etc), while the larger sized pans suit other purposes better. I orders these 1/6 pans for special events where I needed salad dressing in a container to scoop from. Used with a ladle and they served the purpose several time. Great buy. These steam table pans are okay quality. However, I was expecting them to be better quality. On a daily use we noticed they started to get signs of usage quickly, like dents here and there. Great price though. Thank you for your feedback! If you have any concerns with your product please reach out to our Customer Solutions team! Nice and sturdy, fits the way it's supposed to. All the 1/6 pan lids I have seem to fit it just fine, so no surprises there. Highly recommended product. This 6 pan is great quality. Extremely durable and fit correctly into a hotel pan. This pan is priced a great price. We will be ordering more in the future. These work great in the steam wells as well as in the deli. Great quality, and I have yet to find them for a more reasonable price. great pans here. would buy these again when considering basics for our hot dog cart. super easy to clean & very attractive finish. if i could afford one million of these, i would buy them all. These standard weight stainless steam table pans are great! They just work. They are quality built so no need to worry about that! They are light weight but will last a long time! I recommend these over the plastic ones any day they keep topping is very fresh and they are great for all kinds of restaurants . I recommend them for anyone . These are great for just about everything. It's got a good weight to it, cheaper than any of my local restaurant store. I bought quite a few for my bakeshop. I will be using it to keep my compotes warm in the warmer. Good size- most reasonable for sure, wish I had gotten more of these and less of the 1/3 size, those are really big. Good quality too. We use these for just about everything in our kitchen! The only thing that I would change would be the edges, they're too thin and difficult to grab out of the prep station when pressed up against each other. But this is only an issue when you need to change out or refill an item during a shift. Got a few of these to use on our line (fast casual restaurant) and they do not disappoint. No doubt we'll be using these for years to come. These are great for storing smaller portions of soup in a steam table, and the stainless steel makes them look nicer and much more durable. Just your metal pan here. So durable and easy to clean when things get really stuck on. Round corners are nice so you don't ding up your hands. The 1/6 size standard weight steam table pan is great for hot and cold uses. Quality is comparable to the other name brands that cost more. Good bang for your buck. This 1/6 size pan is so perfect for storing our sides. They are sturdy and still look new. They are easy to clean and such a great price! The price of these are really great. They don't stick together, come packaged well, really good quality. They are true to size, and meet all of our needs. Any food professional knows you can never have too many of six pans! These are durable, have a nice wall thickness, and are affordable-making these a nice option for your establishment. These pans are perfect for the general consumer or for a commercial establishment. They are an ideal way to hold product to cool quickly and easily. These 1/6 pans are great for our refrigerated pizza and sandwich prep tables. We use these daily and definitely recommend to others. We will continue to buy. These pans are literally the best you will get for your money. The cheapest offered on the website, yet upon delivery you won't tell them apart from pans costing four times as much. which certainly frees you to grab some extras! Great product and sturdy. Fits all the lids that we have and we have a mix of brands so that is a huge plus! Nothing worse than having mis-matches and nothing fits. Cleans easy and doesn't warp in the dish machine like some brands do. I will keep buying these as i need them. Fair warning when they come you will get frustrated taking them apart. They air lock to each other and it is so frustrating. But its a great product that shouldn't prevent you from purchasing. Love these stainless steel steam table/hotel pans. They are the perfect size to fit into my steam table and they are very sturdy and durable! Great product. This standard weight pan serves it's purpose well for light to medium usage, as is the case for us. These work great on the steam table! Most versatile product in the restaurant. We use these in front and back of house. They do not get stuck together when they are stacked on top of each other either. These work great for food storage. The stainless steel is great as it keeps the cold and heat in better than the plastic ones. The edges do become warped eventually, after daily use, but for the price, you can't beat them! We appreciate your review, Chris! If you are ever looking for more information on a product before completing your purchase, please contact our Customer Solutions team. These pans work wonderfully in my sandwich prep cooler for spreads and salads. Items stay cold and fresh and clean up is easy and convenient. Real affordable. The quality is excellent, they don't dent easily even after being dropped many times. They stack nicely into one another without getting stuck, so you can take them apart easily in the middle of a rush. Great pans, great price. They don't stick together and clean very well. These metal pans are great for the conduction of cold temps. better than the plastic. I've purchased so many of these and they are a great price. Why even by used at a auctions etc..when you can buy new for cheaper. Fantastic price for a stainless steel steam table pan. Heats up very rapidly and can chill foods extremely quickly. These pans clean and sanitize very easily. Very good item, durable and easy to clean, good to keep and cooler freezer or storage area. Easy to wash, and not breakable in case you'd drop it. These are fantastic at keeping stackable ingredients together and organized. It's also anti-jam, which helps to remove the hassle of washing and worrying abotu stacking. Great steam table or cold prep pans. They fit snugly into my custom made steam table and ice station. Even into the lowboy sandwich prep area. Heavy gauge steel that wont get all dinged up during normal use. Stacks well with others and doesn't get stuck there. Works as it's intended. The product was packaged carefully and shipped with short order. Our business will continue to do business with webstaurant indeed. These guys have their stuff together. good build quality product, received some with dents, but customer service refund me second day , Highly recommend get 100% more than what you need . I like these a lot. They feel a little flimsy and the corners bend a little easily but they are still decent and are a good price. I use these for defrosting 1 qt bags of spaghetti sauce and it the bag fits perfectly in the bin. These sit very sturdily on the counter or in the fridge with my constantly worrying about it tipping over. I would buy this again. These are our go to. We have several pans of this brand and have always relied on them. We always have several on the line as well as full of backups in the fridge. This 1/6 size pan fits inside your prep table with the proper bars. It's a nice stainless steel that will last a long time. It's 6" deep so we keep our more requested product stocked in here. Great standard six pan. Great size for holding product in low boys, or in steam tables. Easy to clean and can take quite a beating. We bought additional steam wells (see SKU 177W50), 1/3 and 1/6 pans, and lids. All fit and work very well together. Very good price compared to our local depot. 6" depth was good for holding our chowder and other soups through a lunch service. 6 pans and 9 pans are probably the most commonly used hotel pans in a professional kitchen, so its no surprise that I use these for all kinds of things, not only food prep. They're a good size for small trash/scrap bins for your station. 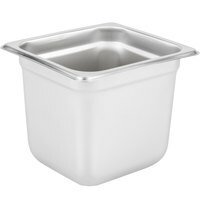 I love these pans they are easy to wash and maintain no discoloration so you can put items that like tomato soup in it and it's not going to stay in the container easily clean would highly suggest. Beautiful, sleek look. You can not beat the price of these pans. Very good quality and you can't go wrong! will be ordering again! ! Perfect for any pizza or sub prep table. The Stainless Steel keeps all our product cool and fresh. The depth of 6" allows us to frequently change out mid-day keeping product rotated and fresh also. This 1/6 sized stainless steel pan is very durable and can hold either hot or cold product. It is great because it is a deeper pan that holds more. Bought a dozen of these for our prep line and they are exactly what you expect. Prices on webstaurant are hard to beat, especially when you buy bulk! The 1/6 size standard steam table hotel pan is durable and the size we use to hold all the vegetables and dressings on our salad bar. easy to clean and stack. I did order these pans, but they are slightly thinner than I expected. They do serve the purpose they were purchased for, but I would of hoped they were a bit thicker. At first, I had my doubts whether or not it was the size that I was looking for. What a surprise! It is exactly what I was looking for and what I needed. This item is the perfect size and I will be ordering more! Great price. I use this time after time in my convection oven and it's great. It's really easy to clean and durable. No argument what so ever on this product. These steam pans work great. They easily come apart, are sturdy, and don't bend in the corners. I would definitely purchase more if I need them. Perfect size for prepping ingredients. Only thing I found with this product, even though it says its stainless steel, I have experienced a few of these have built up a light layer of rust that does scrub away easily. Great quality product and holds food both hot and cold. They stack easily and come apart with ease. Easy to clean and refill. Will buy again. I use these for my steam tables for all of my hot foods. They fit perfectly in there without having any open spaces for the steam to escape. Easy to clean and very durable! We use this to hold our cheese, and has done well for what we need it for. It's a great insulator and easy to clean, has held up against rust well. The 6 inch deep pan is where its at. If you dont have these for your low boy cooler then I suggest buying some now. These containers do what they say. They don't jam! they are perfect for keeping hot products on your steam table or even for storing meats in the coolers. It just seems we can't have enough 1/6 pans. We use them not only for our refrigerated tables, but also for storage where their shape makes them pack perfectly. Perfect for liquids, such as soups or sauces, greens, fruit, or pretty much anything that you need to put on the line. Highly recommend this product! Very durable metal 1/6 pan. Perfect for liquids, such as soups or sauces, greens, fruit, or pretty much anything that you need to put on the line. Highly recommended! Bought 48 of this, it is a great buy, best price i can find, and it fits the spot very well, i would give 10 star if i can. Perfect for hotwells and for food prep. My only complaint is these pans are fairly light weight and will dent easily if dropped other than that they work well for us especially for the price! The 1/6 anti jam steele steam table is a solid product. Its almost universal in the kitchen and it fits amazingly in a bane marie. These 1/6 pans are very important for a line. Our cooks use these and abuse these and they are still working and looking great! A fantastic buy at this price. Great for holding small amounts of sauces on a cooking line. These are very durable and have held up nicely with no dings or dents. Great value. We keep plenty of these in stock in order to keep or items fresh and rotated. Our kitchen staff highly recommends them. Great item and durable. This sixth size anti jam pan is a great value. The deep size is useful for storing larger volumes. The anti jam feature is essential. These are good. The anti jam is nice on them. Keep things cold enough and go through dish and are pretty scratch resistant. Great price. Every restaurant uses these pans, but not every restaurant uses the anti-jam version of them. I can't believe I wasted so much time and labor and frustration dealing with the slightly cheaper "jam pans." These anti-jam pans are the future. The 1/6 size steam table hotel pan holds butter very well for us. It is quite durable and it cleans up easy with a metal scour pad. Great value. The pan is made with high quality, love the fact that they do not jam. We use these pans for our food truck and they last for a long time. Fast delivery. I could not find this locally but was pleased to see it on your website. You have so many great and affordable items. Everything previous reviewers have said and more! At such a great price pick up several of these handy for use along with storage applications for duplicates. This is a great size pan for chili or cheese. Keeps it nice and hot all day long. This is a nice middle sized pan for any side dishes you are looking to serve. I use these every day and have not had any issues with them. Great buy for the price. Websteraunt always has the best prices. These anti jam pans are great when you have to stack them all on top of each other. Great for the price and should last a long time. You cannot go wrong with Stainless Steel. It looks great, holds up to the roughest treatment and does not crack or get stuck. The depth makes storing a larger amount of an ingredient a breeze. These steel sixth pans are high-quality and are great for meats, cheeses, sprouts, and anything you want to keep extra chilled. They were a great quality for the best price possible. Perfect sized Steel Steam Table pan for all of my dressings and an assortment of fruits and vegetables. As stated made of steel and keeps things colder longer. The quality and price point of this product is great. We aren't able to find this good of a quality for this low of a price at our local restaurant supplier. when it comes to 1/6 pans I love the strong stainless steel. they cost a bit more than the plastic. but they will last forever, and here they are a great price. We purchased this for our mobile ice cream truck. This is used to store our strawberry sauce. My husband cut a hole in our counter top and this fits perfectly in the counter, preventing it from moving or falling over when driving through the streets, very good product, highly recommend! Can't say anything bad about these or the fact that you never have enough of these. The price can't be beat anywhere and they hold up well. These 1/6 pans are great! We use in our steam table and they keep the food a nice hot temp! Very easy to remove, they fit nicely and are a good price! Nice size for putting ice in and then using another 1/6th size pan inside it to put condiments in like pickles and onions. Great way to keep stuff cold on those hot days. The pans are great as we needed something that would keep hot food hot. These do the job and there is no need to warm food in micro-wave now. Great pans and great price. 6" Deep, 1/6 Size Standard Weight Stainless Steel Steam pan very good price, almost half than any other suppler. anti-jam, fit in my line cooler.When I need that I will order here again. These work great in our coolers and steam tables, and they are easy to put in and remove. They have a great weight and hold up well. Good price and very serviceable. I like the straight-sided containers better functionally, but these are o.k. They hold up well and don's get too dented with regular use. This is something every restaurant needs for their steam table. We use the 6th pans to keep all of our sauces nice and hot. Very good price on here. Great pans, they are sturdy and versatile to use in our steam table or cooler table and when the day is done, pop the lid on and store in the refrigerator overnight. Great money saver. Our kitchen staff really likes this steam table pan as it holds a lot and is very sturdy. Easy to stack. I'm ordering more today! Good pan for the price. Meets all sorts of needs. No denting or issues with sticking to other pans so far. Would purchase again definitely. This 6" deep pan is perfect for those plastic squeeze bottles that hold ketchup and mustard. The stainless steel makes for easy cleaning and doesn't stain like plastic.